In-app billing frees you from processing financial transactions, but you still need to perform a few administrative tasks, including setting up and maintaining your product list on the publisher site, registering test accounts, and handling refunds when necessary. You must have an Android Market publisher account to register test accounts. And you must have a Google Checkout merchant account to create a product list and issue refunds to your users. If you already have a publisher account on Android Market, you can use your existing account. You do not need to register for a new account to support in-app billing. If you do not have a publisher account, you can register as an Android Market developer and set up a publisher account at the Android Market publisher site. If you do not have a Google Checkout merchant account, you can register for one at the Google Checkout site. 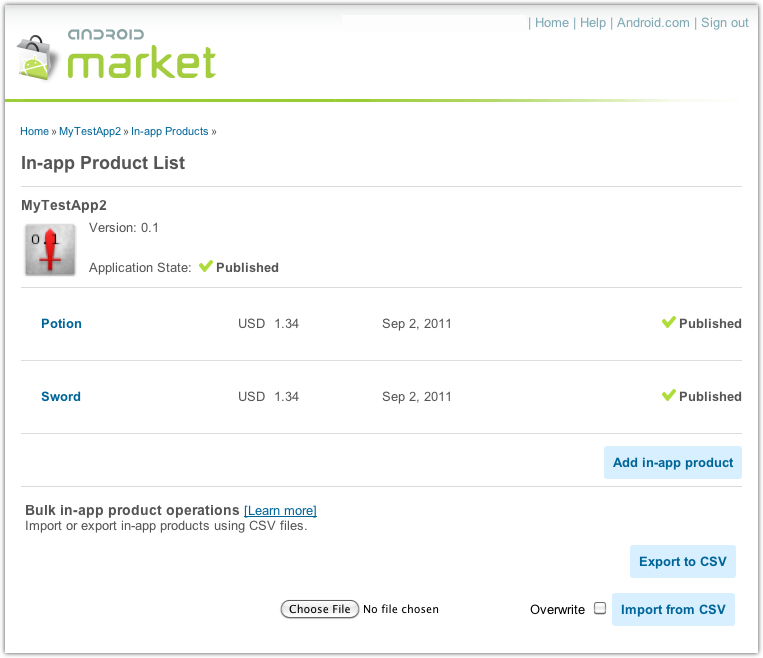 The Android Market publisher site provides a product list for each of your published applications. You can sell an item using Android Market's in-app billing feature only if the item is listed on an application's product list. Each application has its own product list; you cannot sell items that are listed in another application's product list. 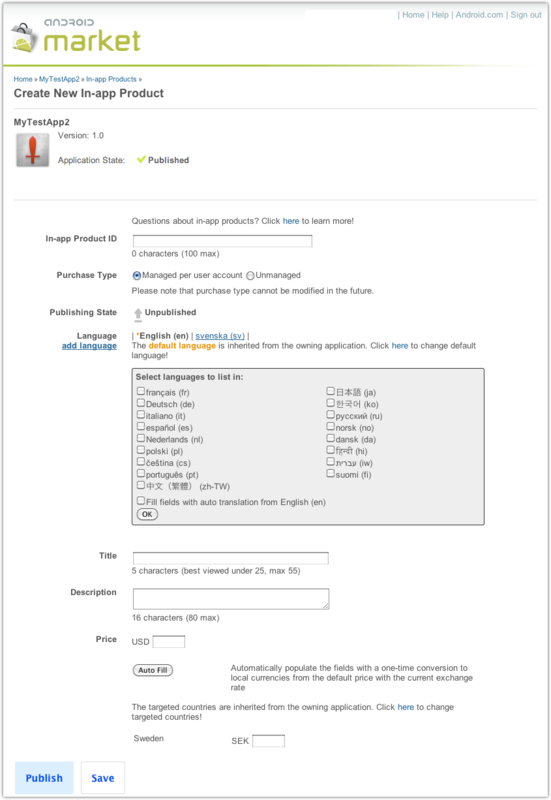 You can access an application's product list by clicking the In-App Products link that appears under each of the applications that are listed for your publisher account (see figure 1). The In-App Products link appears only if you have a Google Checkout merchant account and an application's manifest includes the com.android.vending.BILLING permission. Figure 1. You can access an application's product list by clicking the In-App Products link. A product list contains information about the items you are selling, such as a product id, product description, and price (see figure 2). The product list stores only metadata about the items you are selling in your application. It does not store any digital content. You are responsible for storing and delivering the digital content that you sell in your applications. Figure 2. An application's product list. You can create a product list for any published application or any draft application that's been uploaded and saved to the Android Market site. However, you must have a Google Checkout merchant account and the application's manifest must include the com.android.vending.BILLING permission. If an application's manifest does not include this permission, you will be able to edit existing items in the product list but you will not be able to add new items to the list. For more information about this permission, see Updating Your Application's Manifest. In addition, an application package can have only one product list. If you create a product list for an application, and you use the multiple APK feature to distribute more than one APK for that application, the product list applies to all APK versions that are associated with the application listing. You cannot create individual product lists for each APK if you are using the multiple APK feature. You can add items to a product list two ways: you can add items one at a time by using the In-app Products UI (see figure 3), or you can add a batch of items by importing the items from a comma-separated values (CSV) file (see figure 2). Adding items one at a time is useful if your application has only a few in-app items or you are adding only a few items to a product list for testing purposes. The CSV file method is useful if your application has a large number of in-app items. In the All Android Market listings panel, under the application name, click In-app Products. 在All Android Market listings區塊裡，APP名稱底下，點擊In-app Products. On the In-app Products List page, click Add in-app product. 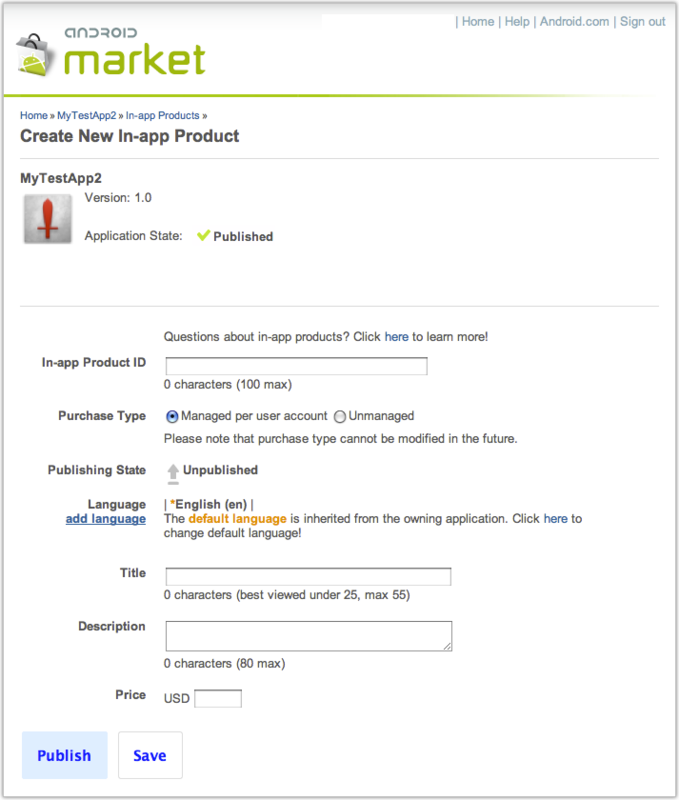 On the Create New In-app Product page (see figure 3), provide details about the item you are selling and then click Save or Publish. Figure 3. The Create New In-app Product page lets you add items to an application's product list. In-app Product ID Product IDs are unique across an application's namespace. A product ID must start with a lowercase letter or a number, and must be composed using only lowercase letters (a-z), numbers (0-9), underlines (_), and dots (.). The product ID "android.test" is reserved, as are all product IDs that start with "android.test." In addition, you cannot modify an item's product ID after it is created, and you cannot reuse a product ID. Purchase Type The purchase type can be Managed per user account or Unmanaged. You can never change an item's purchase type after you set it. For more information, see Choosing a purchase type later in this document. Publishing State An item's publishing state can be Published or Unpublished . To be visible to a user during checkout, an item's publishing state must be set to Published and the item's application must be published on Android Market. Note: This is not true for test accounts. An item is visible to a test account if the application is not published and the item is published. See Testing In-app Billing for more information. Language The language setting determines which languages are used to display the item title and item description during checkout. A product list inherits its default language from the parent application. You can add more languages by clicking add language. You can also choose to have the title and description automatically translated from the default language by selecting the Fill fields with auto translation checkbox (see figure 4). If you do not use the auto translation feature, you must provide the translated versions of the title and description. Title The title is a short descriptor for the item. For example, "Sleeping potion." Titles must be unique across an application's namespace. Every item must have a title. The title is visible to users during checkout. For optimum appearance, titles should be no longer than 25 characters; however, titles can be up to 55 characters in length. Description The description is a long descriptor for the item. For example, "Instantly puts creatures to sleep. Does not work on angry elves." Every item must have a description. The description is visible to users during checkout. Descriptions can be up to 80 characters in length. Price You must provide a default price in your home currency. You can also provide prices in other currencies, but you can do this only if a currency's corresponding country is listed as a target country for your application. You can specify target countries on the Edit Application page in the Android Market developer console. To specify prices in other currencies, you can manually enter the price for each currency or you can click Auto Fill and let Android Market do a one-time conversion from your home currency to the currencies you are targeting (see figure 4). Figure 4. Specifying additional currencies and additional languages for the item title and description. For more information about product IDs and product lists, see Creating In-App Product IDs. For more information about pricing, see In-App Billing Pricing. Note: Be sure to plan your product ID namespace. You cannot reuse or modify product IDs after you save them. product_id This is equivalent to the In-app Product ID setting in the In-app Products UI. If you specify a product_id that already exists in a product list, and you choose to overwrite the product list while importing the CSV file, the data for the existing item is overwritten with the values specified in the CSV file. The overwrite feature does not delete items that are on a product list but not present in the CSV file. publish_state This is equivalent to the Publishing State setting in the In-app Products UI. Can be published or unpublished. purchase_type This is equivalent to the Purchase Type setting in the In-app Products UI. Can be managed_by_android, which is equivalent to Managed per user account in the In-app Products UI, or managed_by_publisher, which is equivalent to Unmanaged in the In-app Products UI. autotranslate This is equivalent to selecting the Fill fields with auto translation checkbox in the In-app Products UI. Can be true or false. title This is equivalent to the Title setting in the In-app Products UI. If the title contains a semicolon, it must be escaped with a backslash (for example, "\;"). A backslash should also be escaped with a backslash (for example, "\\">. description This is equivalent to the Description in the In-app Products UI. If the description contains a semicolon, it must be escaped with a backslash (for example, "\;"). A backslash should also be escaped with a backslash (for example, "\\">. autofill This is equivalent to clicking Auto Fill in the In-app Products UI. Can be true or false. The syntax for specifying the country and price varies depending on which autofill setting you use. country The country for which you are specifying a price. You can only list countries that your application is targeting. The country codes are two-letter uppercase ISO country codes (such as "US") as defined by ISO 3166-2.
price This is equivalent to the Price in the In-app Products UI. The price must be specified in micro-units. To convert a currency value to micro-units, you multiply the real value by 1,000,000. For example, if you want to sell an in-app item for $1.99 you specify 1990000 in the price field. On the In-app Products List page, click Choose File and select your CSV file. The CSV file must be on your local computer or on a local disk that is connected to your computer. Select the Overwrite checkbox if you want to overwrite existing items in your product list. This option overwrites values of existing items only if the value of the product_id in the CSV file matches the In-app Product ID for an existing item in the product list. Overwriting does not delete items that are on a product list but not present in the CSV file. On the In-app Products List page, click Import from CSV. An item's purchase type controls how Android Market manages the purchase of the item. There are two purchase types: "managed per user account" and "unmanaged." Items that are managed per user account can be purchased only once per user account. When an item is managed per user account, Android Market permanently stores the transaction information for each item on a per-user basis. This enables you to query Android Market with the RESTORE_TRANSACTIONS request and restore the state of the items a specific user has purchased. If a user attempts to purchase a managed item that has already been purchased, Android Market displays an "Item already purchased" error. This occurs during checkout, when Android Market displays the price and description information on the checkout page. When the user dismisses the error message, the checkout page disappears and the user returns to your user interface. As a best practice, your application should prevent the user from seeing this error. The sample application demonstrates how you can do this by keeping track of items that are managed and already purchased and not allowing users to select those items from the list. Your application should do something similar—either graying out the item or hiding it so that it cannot be selected. The "manage by user account" purchase type is useful if you are selling items such as game levels or application features. These items are not transient and usually need to be restored whenever a user reinstalls your application, wipes the data on their device, or installs your application on a new device. Items that are unmanaged do not have their transaction information stored on Android Market, which means you cannot query Android Market to retrieve transaction information for items whose purchase type is listed as unmanaged. You are responsible for managing the transaction information of unmanaged items. Also, unmanaged items can be purchased multiple times as far as Android Market is concerned, so it's also up to you to control how many times an unmanaged item can be purchased. The "unmanaged" purchase type is useful if you are selling consumable items, such as fuel or magic spells. These items are consumed within your application and are usually purchased multiple times. In-app billing does not allow users to send a refund request to Android Market. Refunds for in-app purchases must be directed to you (the application developer). You can then process the refund through your Google Checkout merchant account. When you do this, Android Market receives a refund notification from Google Checkout, and Android Market sends a refund message to your application. For more information, see Handling IN_APP_NOTIFY messages and In-app Billing Pricing. Important: You cannot use the Google Checkout API to issue refunds or cancel in-app billing transactions. You must do this manually through your Google Checkout merchant account. However, you can use the Google Checkout API to retrieve order information. 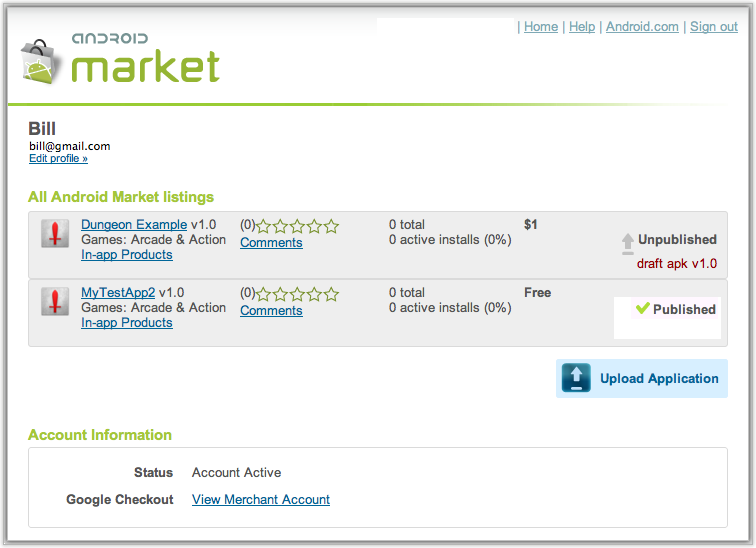 The Android Market publisher site lets you set up one or more test accounts. A test account is a regular Google account that you register on the publisher site as a test account. Test accounts are authorized to make in-app purchases from applications that you have uploaded to the Android Market site but have not yet published. You can use any Google account as a test account. Test accounts are useful if you want to let multiple people test in-app billing on applications without giving them access to your publisher account's sign-in credentials. If you want to own and control the test accounts, you can create the accounts yourself and distribute the credentials to your developers or testers. Test account users can make purchase requests only within applications that are already uploaded to your publisher account (although the application doesn't need to be published). Test accounts can only be used to purchase items that are listed (and published) in an application's product list. Test account users do not have access to your publisher account and cannot upload applications to your publisher account. On the upper left part of the page, under your name, click Edit profile. On the Edit Profile page, scroll down to the Licensing & In-app Billing panel (see figure 5). In Test Accounts, add the email addresses for the test accounts you want to register, separating each account with a comma. Click Save to save your profile changes. Figure 5. The Licensing and In-app Billing panel of your account's Edit Profile page lets you register test accounts. If you have questions or encounter problems while implementing in-app billing, contact the support resources listed in the following table (see table 2). By directing your queries to the correct forum, you can get the support you need more quickly. Table 2. Developer support resources for Android Market in-app billing. Development and testing issues開發與測試問題 Google Groups: android-developers In-app billing integration questions, user experience ideas, handling of responses, obfuscating code, IPC, test environment setup. Market billing issue tracker市集金流問題追蹤 Market billing project issue tracker Bug and issue reports related specifically to in-app billing sample code.